On a hot day, there are few things as refreshing as a Mint Melon cooler. Its healthier to opt for fruit juices to quench your thirst rather than drinking sugary/ aereated drinks. 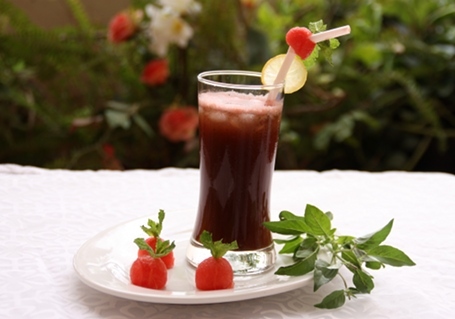 You can twist the taste of fruit juice by adding a couple of green herbs to it. Strain into glasses partly filled with ice-cubes and enjoy this refreshing drink. Based on your taste and sweetness of the water melon used, you may or may not need to add sugar. Please taste the drink and add sugar only if required. Remove any tough stems from mint leaves or lemon basil before blending the ingredients. If you can’t find lemon basil you can use regular basil and add a few drops of fresh lime to the cooler. For an exotic garnish, you can freeze mint leaves into ice cubes before serving. Do not preserve this drink as the pureed mint leaves darken with time and spoil the taste.